Sachin Tendulkar celebrates 44th Birthday at Wankhede Stadium amidst fans! Home Garam News Sachin Tendulkar celebrates 44th Birthday at Wankhede Stadium amidst fans! The most worshipped cricketer of the world and one of the greatest batsman of all time, Sachin Tendulkar celebrated his 44th birthday at Wankhede Stadium, Mumbai yesterday watching the IPL match between Mumbai Indians vs Rising Pune Supergiants. He will always be greeted as the ‘God of Cricket’. He is the run-scorer of all time and surely the biggest cricket icon the sport has ever known. In the history of Indian cricket has this never happened that a cricketer has been loved so much by his fans that the stadium was echoed by the fans singing the birthday song for him. They were shouting his name aloud and were getting crazy about him. 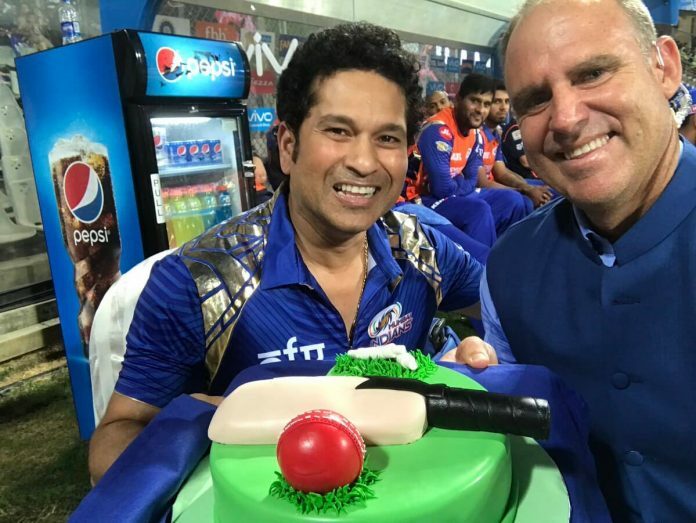 After he cut his birthday cake which was brought by Matthew Hayden which featured a cricket bat and a ball on a cricket field, the whole stadium was filled by the voices of thousands of people singing his birthday song. The crowd chanted Sachin-Sachin, whenever he appeared on the screen. Few of them even adorned t-shirts with his name on them. He was not only wished by his fans but also got greetings from famous personalities like Virat Kohli, Rohit Sharma, Matthew Hayden, Suresh Raina and Hardik Pandya on Twitter. Mukesh Ambani and Nita Ambani also attended his birthday celebration at Wankhede. All India Bakchod’s co-founder Tanmay Bhat posted his greeting on Twitter saying that Sachin Tendulkar has always been an inspiration in his life and thanked him for making his childhood memorable for him.